Cold brew, or iced tea (and we’re not talking about the Long Island variety here) is a thirst quenching alternative to a hot cuppa. Like everything we do at Noble Leaf, we are taking things back to basics and our cold brew really is simple yet refined and tastes oh so good. It doesn’t require sweeteners, sugar or syrup, just high quality whole leaf tea, filtered water and a fridge! Cold brew is perfect for hot summers, after exercise or a more healthy alternative to soft drinks. It has all the benefits of tea but cold. 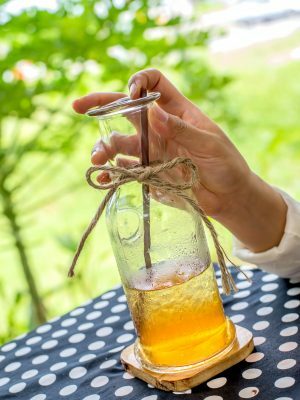 The process of cold brewing brings out different flavours in the tea and a cold brew tea tends to taste more sweet – naturally. Instead of using hot water to steep the tea, you are using cold water and time. Simply place the leaves in cold water and put in the fridge for 6-9 hours or overnight if easier, this drink can become part of your daily ritual – another way to enjoy our superior tea. The longer the leaves steep in the water, the stronger the tea will taste – experiment with your cold brew until you find your perfect flavour. We like ours as they come on the rocks, but if you want to add a little extra flavour then you could try a little lemon, honey or even a sprig of mint but always try it on its own first, as the flavours that come out of the leaves are exquisite! Now refrigerate the cold brew bottle for 6-9 hours, remove the leaves, pour and enjoy!